We provide here several example of Advene packages and hypervideos. 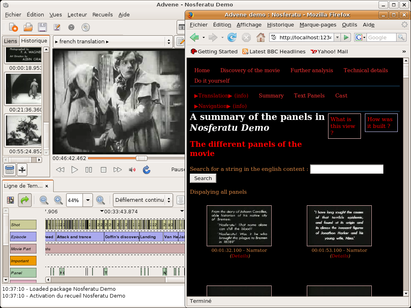 For each example, you can find a reference to an online export of the package's views, which illustrates the capabilities of Advene as a hypervideo authoring environment, as well as the complete package, which can be loaded in Advene to fully experience the Advene features such as dynamic views and data navigation. What is it? The Nosferatu movie by F.W. 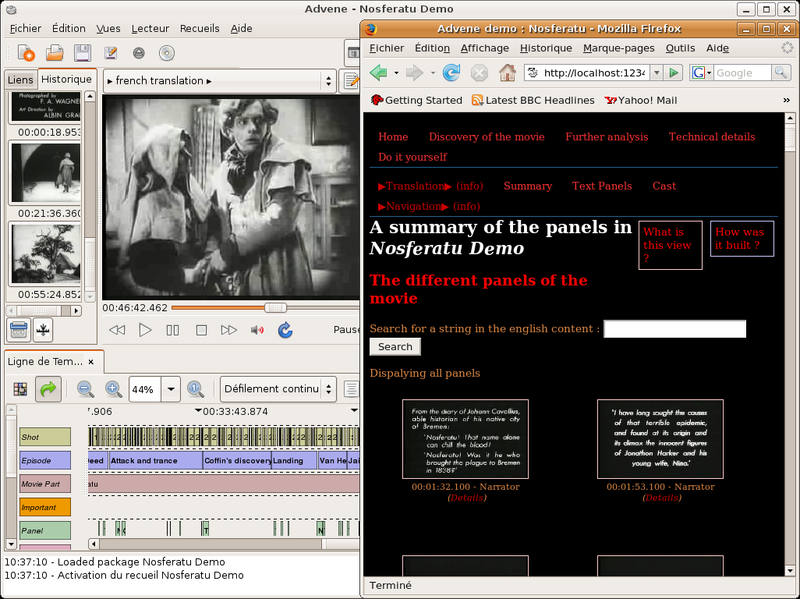 Murnau is a masterpiece that we have been using to demonstrate the various capabilities of the Advene project. The package offers navigation in the movie through summaries (sequences), information for each shot, and a basic analysis of various themes (emotions, nightmarish elements, etc). How can I access it? You can have a look at the online export of the generated static documents. Note that this export does not offer all features (esp. 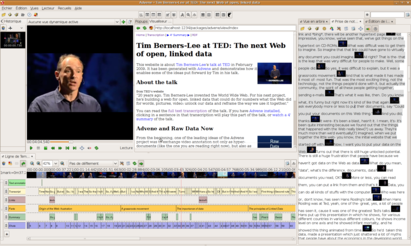 dynamic views) that are available when using Advene. Download and install the latest Advene version. Download the video itself (350 MB) (Right-click and use Save As) from http://www.archive.org/. Download the associated Nosferatu package. Using Advene, open the package, and follow the guidelines given in the presented information. What is it? This hypervideo comprises a full text transcription of the talk, enriched with titles and links, as well as a short summary built from excerpt of the talk. Moreover, a RDF version of some data is available (automatically generated). How can I access it? You can have a look at an online export of the generated static documents. Note that this export does not offer all features (esp. 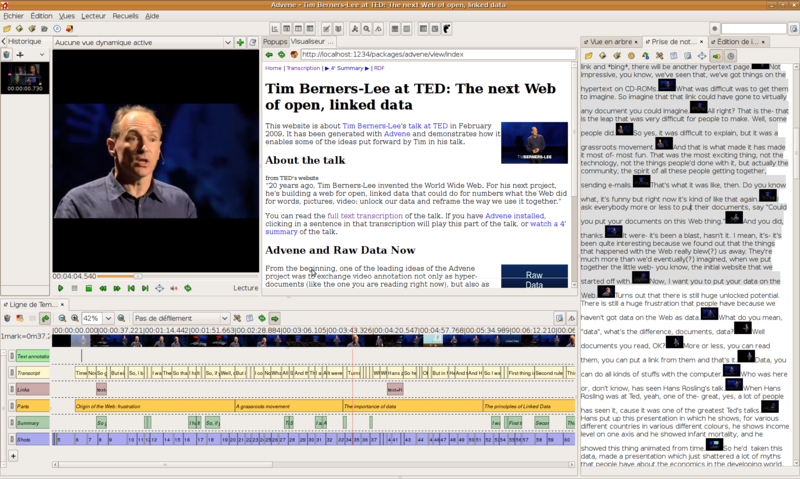 dynamic views) that are available when using Advene. Download the video itself (Right-click and use Save As). What is it? 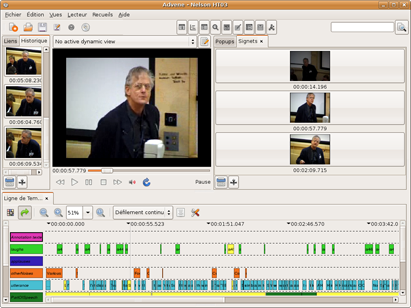 This hypervideo provides a full text transcription for a speech by Ted Nelson at HyperText'03, enriched with titles and links to external references cited during the talk. This package has been converted from an ELAN file found on the ECHO project website. As can be seen on the corresponding video, it is all about deaf language gesture analysis.